The EverFocus NVR-2016 NeVio 16-Channel Mini Network Video Recorder (8 TB) is a reliable Linux-based unit that meets the growing needs of demanding mission critical applications. It allows you to record high-quality videos from megapixel cameras (1.3M) at 240 fps. In addition, this unit records excellent synchronized audio along with the recorded footage. 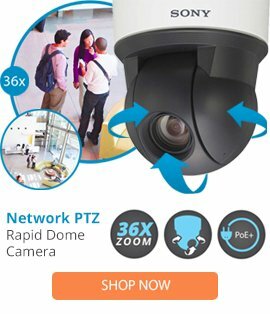 Multiple recording modes like continuous, scheduled, motion detection, event triggered, etc. allow you to easily configure your security system to record based on your requirements. Save on storage space with H.264 compression technology, which also minimizes bandwidth requirements for operations. The DVR features a pre-installed 6 TB of storage space, which can be configured in RAID 0 and 1 configuration for reliable storage of data. This NVR is not only extremely easy to install and configure but also simple to operate with its intuitive GUI that includes a camera drag and drop feature for quick setup and recording. It features 5 intelligent search options that let you quickly locate a specific file for playback. Digital watermarking makes video clips more authentic and suitable for submission as evidence if required. Connecting to a network via the Ethernet port, this DVR features DDNS functionality that allows you to remotely manage monitor, record, and change system settings from any PC on the network. Remote viewing of video feeds is also possible via a compatible Web browser. You can even monitor your premises when you’re away via your iDevice or Android smartphone. For backup or transfer, videos can be easily exported to a flash memory device connected to the DVR’s USB port or via the network. 5.51 x 7.16 x 8.62"